We accept computer-generated artwork files for the Microsoft Windows and Apple OS X (Mac) operating systems. We accept vector-based artwork in the PNG, JPEG, PDF AND PSD. For the highest quality imprints, please provide this artwork at its full size at 300ppi minimum. For example, the imprint area of an Orca® 11 oz. 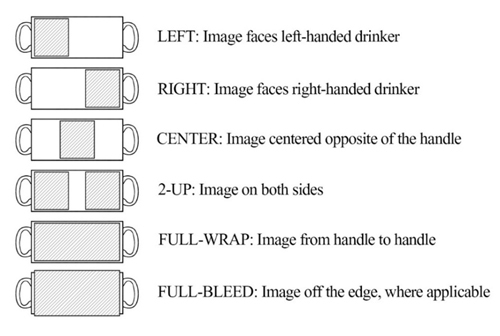 coffee mug is 8.6” x 3.7” and at 300 pixels per inch (ppi), a perfect 1:1 print will be 2580×1110 pixels or more. Please understand that anything smaller will have to be upscaled, causing the image to become blurry and pixelated. We have the ability to imprint artwork with perfect detail and vivid colors, so better quality artwork means a better quality imprint. Any other artwork file types should be exported to an .EPS or .JPG in your software application.